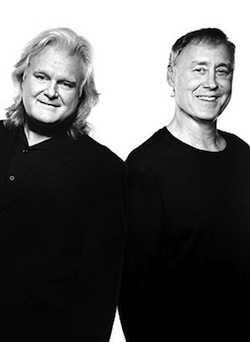 • Ricky Skaggs and renowned pianist Bruce Hornsby will perform music from their new live CD, Cluck Ol’ Hen at an upcoming show at Nashville’s Ryman Auditorium on Oct. 5. Skaggs’ longtime band Kentucky Thunder will also be on hand to perform the batch of brand new songs and bluegrass classics as well as an expansive version of Hornsby’s hit “The Way It Is” with Skaggs and Hornsby at the October show. • Rocker Jack White has been slapped with a restraining order by ex-wife/model Karen Elson for reported harassment allegations, according to The City Paper. Two years after the two threw a “breakup party” celebrating their split, they are now tussling in court over parenting rights for their two kids. The affidavit accuses White of having a violent temper and sending harassing emails and text messages. The two will go toe to toe in court Aug. 29 over their parenting issues. As previously reported, The City Paper will close its doors Aug. 9. • Hunter Hayes will round out his summer with a trip overseas to Japan in late August before he kicks off his first headlining tour in October. Hayes will play two full shows at Tower Records Shibuya and Tower Records Osaka during the trip and will also join Jason Mraz for a special show at Studio Coast in Tokyo Aug. 26. « Charlie Cook On Air: Comic Con Comes To Nashville?